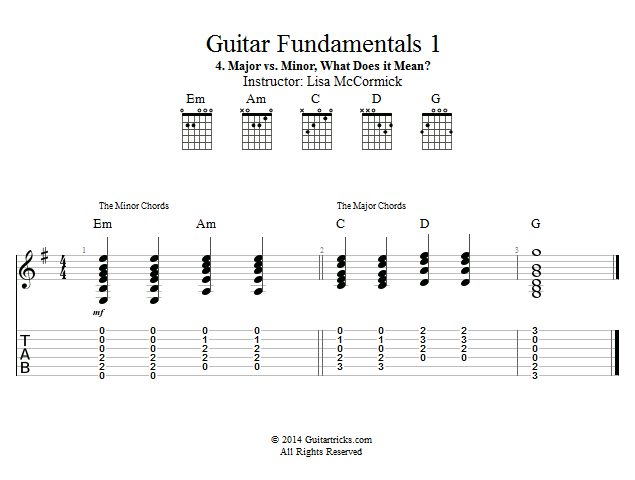 Guitar Lessons: Major vs. Minor, What Does it Mean? We've been tossing the terms 'Major' and 'Minor' around, but what do they mean? In a nutshell, they have to do with how the specific notes within a chord add up to create a cheerful mood (major chords) or, a more melancholy mood (minor chords). Later in the course we will get more into the music theory behind how all of that works, but for now, it is important that you just listen to the chord and see if you can get a sense of whether it is major, or minor. As we get into using these major and minor chords in songs, you will really begin to hear the difference between the moods they evoke.